Is climate change responsible for record cold in U.S.? Maybe not, but that says nothing about the validity of climate change, Climatologist Richard Alley told CNN’s Hala Gorani, sitting in for Christiane Amanpour, on Tuesday. In other words, higher sea levels from greenhouse gases may have contributed to recent flooding in the UK, but the temperatures are mostly the result of a fluke event, the shifting south of frigid polar winds, known as the polar vortex. But it’s not nearly as simple as just saying the cold snap is not a result of climate change. Climate skeptics are using the record cold spell as an argument in support of their contention that the phenomenon is not real. “We scientists don’t like to say ‘undeniable’ – we like to say very high confidence,” Alley said. But, he went on, if he drops his pen he can also say with high confidence that it’s going to fall down, not float upwards. The science, he said, is undeniable. Responding to climate change, he said, is a matter of either reducing the amount of CO2 people put into the air, or putting some of that CO2 back into the earth. A delicate balance built up over a long time is being disturbed. We may not have all the science in place to link cause with effect, but a lot of records are being broken. We have a duty to the planet and to the generations to come. No, it isn't. The fact is that we have had extreme weather events like this for HUNDREDS of years in America.... the issue is that back in the day, people did not whine about the weather issues and prepared better for them. Yes, we have had weather for hundreds of years. And climate. And the data shows climate is changing. You can keep your head in the sand if you want, but the science is the science. Also, they didn't have cars and industries that spewed Carbon Dioxide into the atmosphere. But hey – who cares about facts? Slogans are much better. We've had weather on this planet for 4.5 billion years. Hot, cold, sea levels rising and falling by several hundred feet. Species arise, go extinct. No big deal. But it's a problem for HUMANS because we've delineated countries and property and farmland and we have a lot of very expensive infrastructure, in Galveston or Manhattan. If 20% of the cropland or real estate in the world becomes unusable, it will be a problem for you, personally. It's always absurd to me that we keep debating this. It's approaching ad nauseam. Let me make this extremely simple. I trust Scientist more then politicians to explain the mathematical relationships in the world and how they change over time. I look to Science to explain what is happen if anything, and I look to politicians to explain what are we going to do about it if anything. The short answer is this, regardless of the cause natural or unnatural things are changing. We can make preparations for the changes, or we can ignore them and continue to pay the price. Why are we not building more Sea Walls? Why are we not creating better flood control management? Why are we not making preparations for the changes that are coming regardless of why they are going to happen? The problem is that scientists are sometimes wrong. Maybe they don't properly interpret the data, maybe they omit some relevant data, maybe they just make wrong assumptions. Scientist used to think the world was flat and the sun revolved around the earth. Last year, we were told that 2013 would have a large number of hurricanes and those storms would be larger than in the past. However, 2013 was EXTREMELY quiet. If we can't predict seasonal storms with much repeatability, then how can we pretend to understand the complete global climate picture with such certainty. We should continue to gather data, make common sense changes, but not freak out over something we may have little control over. If we don't understand the true causes, then we are just doing a bunch of actions that may not address the problem at all. Meanwhile, I am paying several times more for light bulbs and have seen several increases in my power costs due to regulations that may or may not be valid. Yes, because when 97% of scientists from all over the world agree that something is happening, the prudent approach is to wait until the other 3% come to agree with them. So, 97% of scientists are very probably onto something that will have dramatic effects on the lives of our children and grandchildren, but you still have doubts, fair enough. Now in light of this 'uncertainty' tell me what is worse, you having to pay a bit more for your energy consumption, or ruining the future of your offspring ? Crashman – you need to check on the validity of the 97% of scientists you mentioned. You'll find it's a lie – in fact if you have a serious look, you'll be horrified when you learn how the figure was derived, and how we are being misled. Let me know if you need sources, but better if you research this yourself, so you don't feel directed in a particular direction. Johansaed, As I posted earlier, you need to research this 97% figure. It's a lie – sorry but that's the kindest way I can find to put it. You're being conned. Climate change models predict we'll experience higher highs and lower lows and new record highs will be set more often than new record lows. That appears to be happening. Of course records are broken every day. We have less than 200 years of temperature data, and it is questionable how accurate even that data Is. Could thermometers in 1814 accurately record to the 100th of a degree? How does anyone know if the models climatologists use to "adjust" for metro areas are 100% accurate. The earth is billions of years old, 200 years of data can, in no way, be considered statistically valid. The idea that CO2 is a greenhouse gas and therefore the temperature must be rising is akin to saying "I see you are eating a candy bar, candy causes obesity, therefore you are statistically certain to be obese". No Thermometers in 1814 could not be as accurate as today, but you know what there are ways to account for that in statistical modeling. Also with a big enough sample size, the central limit theory takes hold and gives you meaningful data. This is how BF was able to produce his farmers almanac with such good results in the 1700 hundreds. Repeated observation and data collection even if the data was not ideal. You say statistical models account the 1800 thermometers....Can you show me 1....1 model developed by either "climatologists, scientists, or the government" that has properly and acurately predicted the climate over the past 15 years? The 97% scientist...BS has been debunked 100's of times, yet that is the Go to on the left. The climate has been changing for millions of years and an unspecific core sample from 2 million years ago is going to change everythiing. I've seen these same conditions 40 years ago. It's nothing new. In the 70's they were complaining of global cooling yet for 3 years in the north east experienced the warmest temps. The claim that in the 70's that scientists were all talking about a coming ice age or global cooling is a complete myth. It is true there was some articles in Time magazine about a coming ice age, in 30,000 years. Which based on *normal* earth cycles, is still true. But, the fact that CO2 causes warming was known by scientists long before the 60's even if Time magazine did not. Not quite true. The hypothesis that increased CO2 could cause warming existed long ago, and many scientists still support it. However, the effect of CO2 is logarithmic. It's like painting a window black, and no light gets through. Give it another coat of paint, and it makes little difference. So, the effect of increased CO2 is very much in doubt. Now we come the the real question – the assumption is that increased temperature due to increased CO2 will result in positive feedback (eg more water vapour – the strongest greenhouse gas, causing more warming), which will dominate negative feedback (eg cloud cover – cooling). To date there is no evidence to support this hypothesis. The idea of manmade climate change is a total farce! Al Gore should be in jail. Anybody who thinks THIS weather right now is a result of climate change needs their head examined. Oh wait, oh wait, the global warming crowd will tell you (with their built-in excuse) that it's extreme weather, that way they have a lie for when they're wrong. HAHAHAH What a joke. The bigger joke is the idiots who buy this climate change/global warming crap!!!!! So Stephanie D. if these Wackos are so wrong why haven't you written a scientific paper to disprove there data? I mean you are reeling against them without actually doing any research into the methods or data they collected to reach the conclusion they did. There have been thousands of papers written to discredit the "climate change" agenda, they just don't get any play due to the liberal media. By the way only a liberal could think a Carbon tax would work? What we want now is politicians who pass laws raising energy prices, taxing "carbon" (emissions) these electric power plants give off, and raise money for cherished government programs. If the inactive sun continues the next four years, and we have colder winters, then that would offset any warmer summers, including the Arctic sea ice increasing, as it did this past year, and Antarctica having colder temperatures. Lost in the debate on climate change is the influential role of our sun, and is always man's "activities". Why is this? Let us not forget about the Pacific decadle oscillation. The deep sea currents help change weather patterns as well. As for CO2, it is a plant food. Other man made emissions are certainly harmful and should be reduced, but not at an extreme economical castrating rate. The sun is the primary source of heat for the earth, if CO2 traps heat in, must not it reflect heat from the sun back into space before it touches the ground? It is not a one way mirror and we must also not forget that the earth is round, so therefore infared has a higher chance of being reflected back into space due to the curvature of the earth.The most heat trapping component in the atmosphere is water vapor. That is the simple truth. It makes up 97% of the thermal cycle(From IPCC). Just look at a desert temperature swing from night and day and you will see what I mean. New studies into the solar cycle and the link to the cloud formation process have actually made a better link to climate change then any of the models that are currently used. We know the cosmic radiation helps in the creation of clouds and when the sun is very active with solar flares, it pushes more of the cosmic radiation away, thus less cloud coverage, more sun light reaching the ground, and high humidity stays due to lack of precipitation in the cloud cycle. That is warming the earth morer then us and yes I believe humans have contributed to the warming, but are we so egotistical to think we are responsible for it all? Waste your guilt on something better like overpopulation or world hunger. Those things we can quicker than this climate change conundrum. People don't understand climate. The mass of "cold polar air" over US is there, but that means the air in the artic has been replaced by very warm air from here. Guess people dont t alk about the heat wave going on up there? It is a cold wave. In January. In the middle of Winter. It neither proves nor disproves Climate Change theory. But, according to the IPCC, Winters are supposed to get shorter and milder, with less snowfall – i.e. many areas accustomed to getting snow would see milder winters with rain and less snow. (IPCC Group 2, 2001), So a cold snap breaking 20 year records would appear to buck that, but one harsh Winter means little (as does one mild winter). It's how the trend develops over decades that counts. Personally, I don't think enough is understood regarding all the complexities of climate to really know what it will do over time, other than change – because that's all it's ever done over millennia, change. Here we go, climate change (f/k/a/ global warming) is causing us to be colder and get more rain. This coming from the same "scientists" and weather forecasters that can't accurately tell us what the weather is going to be next week! Truth is, there have ALWAYS been cold snaps, floods, heat waves, earthquakes, hurricanes, rain, sunshine, and all the other natural phenomenon that gets attributed to climate change. The only difference now is that but for the past couple of decades news traveled very slowly, and we didn't hear about many things. Today, we know in a nanosecond what is happening on the other side of the globe. And this is magnified by the 24-hr news/entertainment channels looking for something to sensationalize so we'll watch it. Yes, the climate changes. I imagine it has always changed and always will change no matter what. Let's get over it and stop wasting money and government time on it! You realize C that they aren't just looking at one or two events and concluding it's "GLOBAL WARMING" but looking at long term trends in the 100's of thousands of data points collected. If you disagree with there conclusion nothing is stopping you from doing the research crunching the numbers and releasing a report that disproves their hypothesis. And yet they haven't been able to create a model to accurately predict climate with all those 1000s of data points huh? Of course its climate change due to global warming, its a fact that the global ocean conveyor current in the atlantic that brings warmer waters up from the equator has been slowing down and moving further south due to the waters in the arctic being desalinated by melting ice due to warning, temperatures in the arctic have gone up over 6 degrees on average higher than anywhere else. without this warm water the jet stream falls further south and bringing along with it the arctic air which is exactly what is happening, this is going to continue to get worse till one day temps will drop to 100 below zero and will last for weeks then months making life in the north eastern u.s. unliveable, this was all covered in the film "the Day After Tomorrow" go watch it again to see the future. John you may be correct more people die from cold than heat. The data shows we may be on the cusp of another mini ice age. Let see how fun it will be when the so called science is wrong and millions die because its too cold to grow crops and we have actually made the problem worse by lowering our output of Co2. Hey, didn't the sun's polarity just flip, on its 11 year cycle. Of course, the sun's behaviour is "fully understood" if you accept that line from the reborn Y2K brigade. Did this come out of the EU? The same heat wave has also trapped ships in Antartic ice. It also contradicts the IPCC. And please do not cite a Hollywood B movie (Day After Tomorrow) which is based on a fictional book written by Whitley Streiber – a guy who claims to have been abducted by aliens, which has no more science behind it than the "2012" apocalypse movie. Please. That would hardly qualify as a debunking. Polar vortex, El Nino, what other variables are there that can impact and contaminate the data? I'm confused as to why you think the "Polar Vortex, and El Nino (& El Nina)" Contaminate the data. They are valid data points. What I find curious is that there are many people who act as arm-chair climatologists in determining whether climate change is real, let alone who caused it. I do not know about you, but as an architect and not a structural engineer so I trust them to tell me the correct way to support roofs, floors, walls; A non-meteorologist/climatologist person should trust the scientists/climatologists/meteorologists who have all the data and can interpret it better. Overwhelming they believe in climate change and that humans are the cause. Global warming discussion rears up again ... dumb, unscientific conversation, again. The lack of any scientific reveals from the left is amazing. They argue data. It is a total lie ... Margaret Thatcher made it up ... Google that up. She wanted to crush the coal lobby, and made the entire thing up. IF there was any real science, the reveal would sound scientific. Like this, " Hello Doctor Reasor here, I wanted to report that after a T variance test, confirmed by a chi -square test we are .95 degrees higher than normal expected. I am 82% confident that my data links CO2 emissions to the temperature increase. " There is no discussion like this ... because there is no difference between the expected and measured temperature. Why lie? TO CREATE POVERTY! I D.C. tradition, hurting other people for power and money. Since you are an authority on science, let me ask you this: what wavelengths of light does CO2 absorb? Let me change the question, if you close your windows to your house in the winter, it will make your house....warmer!!!! it isn't a conspiracy to make you buy windows. I don't know the science behind the conclusion for climate change nor do I want to get in to a debate about it. I do know that I believe in using scientific and technological advancement to better things. If you look and corporations, many of them in the US are installing newer more energy efficient systems and design. Why? Because it saves them money. Why do they recycle their waste? Because people will pay for those recyclables and it reduces the waste disposal costs by lessening the number of dumpster pulls they have to pay for. The finance departments in these companies know that if you invest the right capital it saves you money in the long run. These results are definite and measurable. Remember when you bought an 8 pack of glass soda bottles? Why don't we use glass anymore? because it's heavy. It costs a lot of energy and money to move something that's heavy. That's why we went to plastic bottles. We also prevented waste when we had to pay deposits on those bottles. Companies found out it's better to use less plastic in their packaging because they can tout that they use less, but it also costs less. It's always about the money. The next great wave of money savings will be when we start to design and retrofit residential living to more energy efficient systems and design. Pres Obama was well intentioned when he spent all that money after the recession started, but he did it all wrong. When we can show people the numbers to saving money by improving their living envelope then things will start to move. If you invested more money in the price of your house by installing more efficient systems, your mortgage payment would be a little higher, but you could deduct more of that mortgage interest on your taxes. On the flip side, you would be saving much more cash every month from lower utility costs to apply towards that mortgage. Finally, for me as a Christian, I believe that if God originally entrusted man to take care of his world, then if I have better options to take care of it, such as composting, recycling, and using clean energy to take care of it then I should absolutely do so. I would like all of the southern and country Republicans that love to showcase their Christianity to put up or shut up. Climate change is not some left-wing plot to tax people more or take away their freedom or kill capitalism. In fact, the new green energy revolution will revitalize our economy if we don't wait until it's too late. Powered by the meshing of renewable energy with Internet technology, it will give individuals more autonomy and free them from the monopoly of the big fossil fuel corporations and the crony capitalism that is robbing us of our democracy. This is something both liberals and conservatives can support. Solar and wind will allow individuals to produce their own green energy in their homes, offices and factories. This is not a pipe dream. It's already starting. Read the new book, The Third Industrial Revolution by Jeremy Rifkin, who is a senior lecturer at the University of Pennsylvania's prestigious Wharton School's Advanced Management Program. It will be real free-market capitalism. The liberal government and media are trying to sell the world on climate change in order to further their agendas. Hurrah! An abnormal cold weather event is not attributed to "climate change" (formerly global warming). Now that truly IS news! I wish everyone would stop throwing insults and just discuss the science. There seems to be much information pointing towards some climate change caused by mankind, but then there also appears much information that refutes that. Why would anyone completely trust scientists? Isn't this the group of people that once swore the world was flat any the universe revolved around the Earth? Back in the sixities, wasn't the fear about the coming ice age? Do we really have enough information to make a conclussion? Are we being intellectually honest with ourselves? Is it prudent to make drastic changes now? or should we collect more data before we act? "Why would anyone completely trust scientists? Isn't this the group of people that once swore the world was flat any the universe revolved around the Earth? " Scientists were the first to change there beliefs about these things when confronted with evidence that disagreed with there earlier belief. The church is the group that made Scientist rebuke there publications or threated them with exile and or death. The claim that in the sixties that scientists were all talking about a coming ice age or global cooling is a complete myth. It is true there was some articles in Time magazine about a coming ice age, in 30,000 years. Which based on *normal* earth cycles, is still true. But, the fact that CO2 causes warming was known by scientists long before the sixties even if Time magazine did not. Anyone that doesn't realize that the vast human species isn't influencing global climate change, is living in a fantasy... Since the Industrial Age humans have been spewing mass amounts of greenhouse gases that DO affect the climate. Most people are too obtuse to understand that it's not global warming, but rather an overall change in weather patterns – thus exacerbating the natural global weather cycle. Smoke a cigarette in a garbage bag and let me know how you feel afterwards… After reading some of these posts, it validates my opinion on our crummy educational system. My biggest problem with climate change (AGW) is there have been monumental swings in Earth's climate for millions of years. 15 thousand years ago during the last glacial maximum you had a mile of ice sheet over half of North America. 65 million years ago till roughly 35 million years ago the climate of what is now Maine was like what it's going to be today in Central Brazil. Now a large group of published and respected climatologists say that we have never warmed so quickly. That is absolutely unverifiable,dont get angry....it isnt!! The fact that they scream that it is should tip you off. There is actually strong evidence you had at least a 6-8 degree increase in world wide temps in just a few hundred years when the Laurentide ice sheet collapsed which was the end of the last glacial maximum. What the vast majority of people don't realize is we are in an ice age right now. We are in an interglacial cycle in between maximums.This current cycle of glacial maximums and minimums started roughly 1.3 million years ago. For large swaths of the Earth's climate history there was zero permanent ice cap at either pole. 65 million years ago the CO2 concentrations were over 800ppm,today they are 380-400ppm up from 320ppm 150 years ago. The Antarctic ice cap didn't start forming till roughly 35 million years ago when CO2 fell below 600ppm. In short my point is,until we can explain what caused the monumental climate swings when we couldn't help with any sort of climate forcing,it's wise to be a skeptic that the one degree of warming we have had since 1900 is our fault. Just be partial,do some research on your own,from reputable sources and studies. The information is out there,form your own opinion. "Record Low"? Using what sample size? Is it possible at all that these cyclic phenomena may have taken place multiple times in ancient eras well before records have been kept? No? Why not? Today is a year since the opening of the 12-12-12 portal and indeed many, many things have occurred behind the scenes which are still in fact hidden from your view. We want to give you a metaphor of what is occurring right now in the higher dimensions for you. Picture a beautiful field of flowers and trees all around, with grassy areas of sunlight and shade and the sun shining upon all. There are tables being set for a grand feast, decorations being put up, and many, many party planning activities are in process. Flowers are being planted in a most beautiful arrangement, fresh food and drink are being laid out, and there is a grand scene of preparation for a beautiful celebration for our earthen humans that will be commencing shortly. This beautiful celebration will be honoring the christed light within each one of you, as well as the principles of sharing, love, unity, harmony, abundance, peace, a merging with the higher dimensions, assistance from the galactic star nations who will also be attending the celebration, and many and all of the higher dimensional principles from which we operate in the angelic and higher dimensional realms. All of these principles will be celebrated during this joyous occasion. All beings on earth are invited to this feast and reunion of our galactic families with beings from your higher consciousness earthen communities, including you. We are showing the channel a vision of these beautiful celebration festivities which are being planned for you. Please take a moment to pause and tune in. We have never had cycles of CO2 in the atmosphere, at the levels it is at presently. Never. Ice core data, among other methods, confirms this. Familiarize yourself with what 99% of the world's climate scientists are saying, and stop exclusively listening to the 1% that are telling you what you want to hear – or even worse, completely scientifically unqualified tools with vested economic or political interests in telling you everything is just fine, or that the "science is still out". As the climate scientist in this article points out – the reality of climate change has absolutely nothing to do with personal politics. Or it didn't, until political operatives decided to treat it as yet another front in the "culture war". These are the same charlatans that try to convince everyone there's a "war on Christmas" ever year. In regards to your "99 percent of scientists" claim: First, it's 97%. Second: One of the main scientific proponents of man-made climate change conducted an analysis of all peer-reviewed research on the subject. He only found that 34% of climatologists came to a conclusion on the subject. Of that 34%, 97% endorsed that idea of anthropogenic (man-made) global warming. So everyone reports this as though 97% of scientists agree, while in reality only 34% of scientists researching the subject have reached a firm conclusion on AGW. Link to the actual paper here: http://iopscience.iop.org/1748-9326/8/2/024024/article. I'll take your correction on the 97%. However, that abstract says the 66.4% of papers didn't express a position on AGW – not that there was insufficient evidence to. There are thousands of papers on climate change, that have nothing to do with deducing root cause, and thus announcing a position is unnecessary. You're conflating that with the climate scientists involved with those papers not personally reaching a conclusion on the question altogether. As the abstract notes, they just did a broad search for any articles on global climate change – not specifically ones addressing whether AGW is real. Of the ones that do address that question, as you say, there is a 97% consensus. And the conclusion of the abstract you link to: "Our analysis indicates that the number of papers rejecting the consensus on AGW is a vanishingly small proportion of the published research." First, a bit on the credibility of "the science is undeniable." Remember how "97% of scientists support global warming"? One of the main scientific proponents of man-made climate change conducted an analysis of all peer-reviewed research on the subject. He only found that 34% of climatologists came to a conclusion on the subject. Of that 34%, 97% endorsed that idea of anthropogenic (man-made) global warming. So everyone reports this as though 97% of scientists agree, while in reality only 34% of scientists researching the subject have reached a firm conclusion on AGW. Link to the actual paper here: http://iopscience.iop.org/1748-9326/8/2/024024/article. Second, while everyone agrees that CO2 is a greenhouse gas, there is a big difference is showing that it can trap heat in a test tube vs. impacting the atmosphere when the increase is about 2 parts per million since the industrial age. For the author to claim that anyone who doubts the impact of this increase somehow doesn't believe that CO2 is a greenhouse gas is nothing more than misdirection, similar to the 97% claim. That abstract says the 66.4% of papers didn't express a position on AGW – not that there was insufficient evidence to. There are thousands of papers on climate change, that have nothing to do with deducing root cause, and thus announcing a position is unnecessary. You're conflating that with the climate scientists involved with those papers not personally reaching a conclusion on the question altogether. As the abstract notes, they just did a broad search for any articles on global climate change – not specifically ones addressing whether AGW is real. My point is that the media narrative over and over is that "97% of scientists support the premise of man made global warming." The author of this paper himself, while providing the clarification in his own paper, leaves it out when doing media interviews. Then people commenting here repeat without understanding that the whole scientific community does not have a firm conclusion on AGW. While you're correct that a very small portion take a firm position on discounting AGW, that's whole point. Most of the community does not feel the data is conclusive enough to form a firm opinion. The climatologists going out on a limb to make it a firm certainty (34%), in my opinion, are the ones that wish to push this as a political issue. To your point, many of the 66% of the papers did not feel a need to cite a cause for climate change. But the author of this is paper is very pro-AGW and this was the best he could come up with. Your own initial comment throws around that 97% stat when you don't really know what percentage of the other 2 thirds really support your theory or not. I would like to see the climate change discussion placed into a broader context. There have been numerous periods of temperatures rising and falling over Earths's geologic record. This discussion should be framed into Earth's historic past to see if we are repeating the past are diverting from it. There have been five known ice ages in the Earth's history. Within each of the 5 recorded ice ages there are periods of more severe glacial conditions and more temperate referred to as glacial periods (cooling) and interglacial periods (warming). So, are we experiencing a typical interglacial period event or not? Please recall, our far distant predecessors did not generate high volumes of green house gases (unless they built too many fires). This interglacial, the Holocene, is a bit on the cool side, and thus far, of average length. The previous, the Emian (sp?) was slightly warmer, with hippos swimming in the Thames. This cycle of warmth within the Holocene is slightly cooler than the last warm period, the Medieval Warm Period, and perhaps about the same as the Roman Warm Period. Thus far, it is significantly shorter than the last warm periods, which ran for ~400 years each. So what happens when a volcano erupts and reverses all the little effort we made in contributing to CO2? Time to start regulating and taxing volcanoes! It depends on the size of the volcanic eruptions. For example, the 1991 Mount Pinatubo eruption is believed to have reduced global temperatures buy 0.5 °C (0.9 °F) for approximately 2 to 3 years. The 1883 Krakatoa explosion is believed to have cooled the earth for 3 to 4 years. It's the amount(volume) of airborne ash and it's distribution that can significantly cool the earth. The message has gotten muddled over the years, one day global warming the next climate change it has gotten the average person confused Wall Street motivated and others defensive. The fact is the phenomenon is fact the messaging flawed, the motivations of all involved are conflicted with the message delivery for such an important issue we must take pause and analyze the ramifications of everything involved, the Earth has a finite atmosphere measured in cubic meters of those cubic meters there is point when contaminants out number the beneficial qualities namely when people can breathe comfortably. The global warming issue concerns when the objective of breathing comfortably is no longer met to which I attest that time has arrived!!! We can no longer pretend that our filth entering the air we breathe is tolerable, in fact during the last 12 hours I can attest that it is not. At 430 this morning my smoke detectors activated in my home, totally electric, no sources of flame nor contaminants in fact I have 20 high capacity air purifiers running full speed 24/7 but to no avail, the inversion over road all my safeguards to which I have no remedies nor defenses!!!! The only solution for myself and all of our nation is to stop the pollution before its too late because Wall Street cares nothing about people only profits!!! We must act soon or we will never act again!!! This is not about some foolish nonsense like a "message" - it is about the fact that many rich and powerful people do not like what the real science says - so they have worked hard to make as many as possible confused. The truth is that Weather Science has always been difficult and uncertain. We know a tremendous amount compared to, say, twenty years ago, but no matter how you slice it weather is a Dynamical System - it cannot be easily predicted with great accuracy. That uncertainty bothers some people, who would rather trust in absolutes - even absolutes that are wrong. If I were a global warming, I mean climate change, specialist, no matter what the evidence says, I'd put this issue in the holster for a little while. For 90% of people, the argument sounds really ridiculous when their kids can't go to school b/c it's too cold. 1) the average world temperature has risen over the last century. This is not a simple linear trend - it has jumps and setbacks, like all REAL data does. But the trend is unmistakable, and the pattern is steeper than linear. 2) even as bitterly cold as this last week has been in the United States, there were very few record colds set here. There have been, actually, very few record colds set in the last ten years. Lots of record highs, very few record lows. If temperatures were NOT increasing, that would not be happening. 3) pushing the earth's temperature higher upsets the overall weather system. Imagine a large pendulum. Push the arm higher (with warming) and what happens? The hots are hotter, and then the pendulum swings back again, causing dramatic cold spells. Earth weather is what mathematicians call a "dynamical system" - a part of Chaos Theory. For centuries we were in a relatively stable period, but we have pushed ourselves out of that period. You only have to look at the other planets in this solar system to see how TRULY crazy weather patterns can be... we can look forward to that in the future. 4) to reiterate, the extreme cold temperatures we have had recently are unusual but actually NOT records, except for a tiny few number of places. On the other hand, Australia DID have many record highs. Remember: GLOBAL warming is about the average temperature over the ENTIRE GLOBE, not just the United States. Americans may think of ourselves as special, but we *are* only *part* of the globe. The data doesn't support what you claim are facts. I have no problem assigning this to "weather", just as I have no problem assigning superstorm Sandy to weather. The cycles of natural Climate Change I have implemented in the past occur over thousands of years. I do this to give the earth ample time to recover and adjust naturally. If man wants to add his own CO2 to the atmosphere and risk accelerating Climate Change to 100 years or less then he has the free will to do so. I hope he has a plan. "Climate skeptics are using the record cold spell as an argument in support of their contention that the phenomenon is not real." Whatever... global climate change IS happening regardless of what the deniers think. In looking at some of the comments here, it would seem that some of you would have us blindly accept Anthropogenic Climate Change theory without question, or without considering the arguments of the Climatologists who happen to be skeptical of the link to human C02 emissions, as well as ignore the fact that the climate has warmed at a much lesser degree than all the models based on Anthropogenic Climate Change had predicted. That's not to say that there's no human influence behind the warming that has been observed over the past several decades, but there are some valid questions regarding what the models have led us to believe vs. what is actually being observed. In a paper just published online a few days ago in the most highly-respected peer-reviewed science journal in the world, Nature, new data showed that climate change is occurring faster than projected and by 2020 the tropics are expected to be "unlivable" and we'll be next, about 2045, assuming we are stupid enough to keep burning fossil fuels. By 2100 global temps are predicted to be 4C higher than today, which means most species, including humans, would not be able to survive. rrriiiiigggghhhhttt. THe same people that said the arctic was supposed to be ice free in 2013. Did you hear about the holly wood types that got stuck in the non existant summer ice? Or more recently in the antarctic? Many haven't got the memo. Global warming morphed into climate change a couple of years ago so the libs can have it both ways, as they are predisposed to do. And all a pathetic grab for dollars for their 'green" businesses that really aren't. But it's all about them feeling good about themselves and superior to others. Has nothing to do about the environment or helping others. Gig is up. Its the 12 year low in the solar cycle.. The global climate is rising, this can't be disputed. But don't think that scientific information from just the last 150 years is the end all be all. In fact, it's really only a drop of rain from a hurricane. The earth is something like 4.5 billion years old. Remember, at one time, there were no cars, factories or millions of cows and yet the earth was so hot it supported the lives of millions of giant lizards. Was it that 200-500 million years ago there was so much giant dinosaur poop that the CO2 levels were off the chart and everywhere you turned it was a jungle? Thankfully that comet hit us and brought the world back into balance. No, it is not climate change. This has been happening for ages. Not to mention the vast majority of scientists. I hope you understand how ridiculous it is to let such not even low temperatures cause tremendous problems. We here in Finland are used to much much lower temperatures but we don´t even imagine that we are a SUPERpower. The deniers consistently confuse weather with climate. When records highs are endured they are quiet and only squeal when the WEATHER turns cold in certain parts of the world. It is a scientific fact that global warming will not affect every part of the world equally. Ignore the melting glaciers, droughts and floods and nature will bit you where it hurts the most. Or I guess ignore the expanding ice sheets and glaciers as well according to your argument. If we have a heat wave...evidence of global warming. If we have a cold snap....evidence of global warming. Sorry, but the way science works isn't independence (although that is what they like to think), it is following the herd. If you step out of that mold, you don't get funding. Thus if the big labs and research centers said the sky is green, you better come up with research questions that will investigate why the sky is green (even though your evidence may not back that up). E.g. Over the eons there are cyclical changes in weather patterns, but because it is "cool" to jump on the bandwagon, we will say it is created by humans in this case. Even though the trend does follow cyclical patterns before humans were around to fart enough to change the environment. Evidence has shown over the past 14 years 6 of them have been hotter than usual, but then again 5 of them have been colder than normal and the rest just normal. It all averages out in the end. Ice sheets in both the Arctic and Antarctic are expanding (e.g. Arctic expanded by 1 million square miles). Then you get the holly wood types that get stuck in the ice that wasn't supposed to be there, but I guess that is global warming. people like to talk about CO2 and its contribution. THis is an issue I have in many of the physiology classes I teach. When I ask "what percentage of the atmosphere is made up of CO2" I usually get responses in whole %. Fact is CO2 is a trace gas. In total it is about 0.038%. The rise everyone talks about is from 0,035%, which in the grand scheme of things is insignificant. The shocking graph that is always shown in the media is skewed. Look at the y axis and see its #s. it doesn't start off at 0. THe reasons is purely for shock effect. Then you get the people that say it is a toxic or unnecessary gas. Believe it or not, but your body's ability to breath depends on CO2, same thing for plant's survival. It is these liberal types that will go around crying the sky is falling that really need to learn the science and how science research works (I am a prof btw), before blowing their lids on how the end is nigh. Bravo. Actual facts! Furthermore, there is >1000x more H2O in the atmosphere than CO2 and it absorbs more wavelengths. The funny thing in all of this, is that most people who support anthropogenic or carbon dioxide induced climate change can not answer the following very important questions (the correct answers will enlighten as to why these questions are important). 1. Please list the top 3 greenhouse gasses in order of decreasing effect (could be considered a two part question because the order is also significant). 2. By what physical process/method does heat leave the earth? Remember, the earth and its atmosphere is in the vacuum of space, or effectively a thermos bottle. 3. How does carbon dioxide act as a greenhouse gas (describe actual physical process). Gore's acts like a blanket gives you an instant F – because it is incorrect, quite misleading and means that the answer is not your own. 4. Which greenhouse gas is not currently correctly/completely modeled in the simulations and why? 5. Why do cosmic rays have a potential effect on climate and climate modeling? How does the solar wind and Van-Allan belts play into this. What is recently starting to happen to the earth and has occurred in the past and how does this play into the Van Allan Belts? 6. Which two 'odd' behaviors of water effect the climate? 7. Approximately what percentage of the atmosphere is carbon dioxide presently? What percentage is oxygen? - got more, but this enough for some thinking. Yes it is climate change related. We've been told an Orwellian lie about carbon dioxide and methane; they both cause global cooling, and the so call radiative forcing they are deem responsible for is minus a few facts as well. The heat is forced into water vapor; it is the only non diabatic gas capable of holding heat that effects the atmosphere. The oil and gas industry is experimenting with methane hydrate harvesting in the Arctic and have been doing so since 2003. The experiments have failed to capture much gas and have released a tremendous amount of heat and methane to the atmosphere. The ice in the Arctic only started melting after the 2003 experiments. Methane hydrate is capable of removing and or releasing up to 400 degree F all at once. Methane oxidizes to CO2. Excess CO2 is putting water vapor higher in the atmosphere where it does not belong and methane is right next to it, forming its hydrate in the sky .That is why hail is getting bigger. Carbon dioxide goes into the water. Carbon saturated water causes global cooling. It does not freeze until it reaches about 22. F The Antarctic is cold enough to get it there. Once there, it is 60 times stronger than regular ice. Winds in the east Antarctic are katabatic and blow from the top of the land mass down to the sea. away from land. January is the warmest month of the year. December is the early summer. NASA recorded the lowest temperature on Earth in December, in the summer, not the winter. 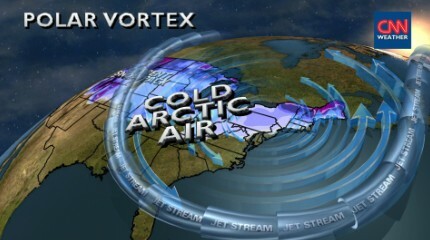 A vortex is created by heat wrapping around cold. All the moisture going over the east coast is going to the Arctic and creating incredible blizzards in Nunavut. When a scientist tells you that they are stuck and the ice is growing in the middle of the summer, you need to verify that. Call NASA and NOAA and get the proof as to where the ice is was blown from. Go to the library and input all the scientists names on the ships to see what they have written about before and who they wrote it for. Finally global warming is being brought to you from the deep earth. We are being steamed from below by radiant heat from dissociating hydrates, for a good part in our seas. Methane is pouring into our seas. There are 7 billion humans, every single one seeking a better life. There are not a one politician in any democratic system that will survive the Next election by woving to restrict possibilities for a better life. Hence global warming is unstoppable until such time that the effect has diminished the population to sustainable Levels. Rather bleak, but probably quite a fundamental observation. The climate change debates are all acting like a smoke screen over this observation, whereas the real question is how to reduce populations to sustanable Levels and at the same time maintain the possibilities for a better life. For some time now I have been thinking about the options before us. It might appear as science fiction at first, but if you think about it, we already have the technology and resources to build sustainable cities in every possible environment, hell even space. Why don't we colonize the deserts (Sahara) or the poles (water problem solved straight away) where animal and vegetation impact derived from such action would be minimal, and then we can have all the Earth's forests full of animal and plant species. I can elaborate on this idea much deeper and argument about its validity, but you get my point. I read ...and then read some more. this writer is full of drivel...paid to put something on the site. The human capabilities are absolutely miniscule to affect anything other than your house or your road or even a skyscraper. I'd fly over a little town that had big frog little pond syndrome. From 2000 feet above the ground, the frogs are extremely small. Face it folks...weather is weather. Al Gore...or Barry ain't gunna change it. They ain't that big!! We've heard a whole lot about how this polar vortex is affecting people – and with good reason. But hasn't anybody considered what happened to the polar regions themselves when their normal polar vortex decided to take a walk south? Has the air over the poles remained as cold as normal? Doubtful. So it probably warmed up, and that ought to be of great concern, since our polar ice, at both poles, seems to be shrinking alarmingly. Anybody know the scoop about the polar weather these last few days? I think that is of some importance. Arthritis is inflammation of one or more of your joints. The two main symptoms include, joint pain and stiffness. Osteoarthritis Ray Ban Mens Wayfarers and rheumatoid arthritis are the two most common types of arthritis. An anti inflammatory usually helps to a degree. You might start with one Aleve twice a day with food or milk and some Tylenol at times of increased pain. Taking the supplement of chondroitin sulfate and glucosamine (OTC 1200/1500 mg a day will help to protect the joints in the long run.) (Some supplements have the added supplements of MSM and hyaluronic acid). The average person attending the Derby bets $157 on the entire race card throughout the day. This is only at Rayban 3362 Wayfarers Churchill Downs (not nationwide simulcasting), and it includes all bets that day. According to mutual clerks I spoke with today, most tickets are punched out for $2 and $5, but a bet between $5,000 and $10,000 is not unheard of on the Derby itself. Usually apply your cosmetics below dazzling, sun light. Lots of people implement their cosmetics inside a improperly lit area and after that realize that their cosmetics is badly employed whenever they capture a glimpse of their reflection outside within the sunshine. Basis especially should always be applied less than vibrant lighting to enable you to make sure that you have enough protection.